UPDATE: Since initially writing this review for the ecobee3, the ecobee4 has been released. Nearly everything I’ve written for the ecobee3 is still true for the ecobee4. They are essentially the same thermostat except the ecobee4 has added an integrated speaker for Amazon Alexa support. I initially bought the ecobee3 with the intention of testing it, writing this review, and then selling it. However, after using it for over 3 months, I have no plans of getting rid of it. It does everything I could ask for in a smart thermostat and more. I haven’t personally had a chance to test all the smart thermostats as extensively as I’ve tested this one, but I’ve done a ton of research and am quite confident that the ecobee3 is the best one for me and probably for most other people as well. Anyone in the market for a smart thermostat is missing out if they don’t at least take a little time to see what the ecobee3 can offer. 7 Is ecobee Compatible With My HVAC System? 8 Which ecobee Is Right For Me? The ecobee3 has a smooth, shiny look to it. The aesthetics of it are only a personal opinion, but I prefer this look over the look of its main competitor, Nest. The Nest is definitely more of a flashy “look at me” kind of gadget whereas the ecobee3 blends in a little more. I think it looks right at home on my wall. It has a rectangular touchscreen that automatically comes on when it senses you in front of it. The touchscreen works well. It’s both responsive to touch and easy to read. All screen brightness settings are fully customizable. In case your thermostat is in a bedroom, you can even have the screen shut off when you’re sleeping. The ecobee3 is firmly anchored as a leader in the smart thermostat market, so it should be no surprise that it is widely supported by third party smart home products. You can control your ecobee3 using your voice. It supports all three major voice assistant platforms (Alexa, HomeKit, and Google). It is supported by Samsung SmartThings, Vera, Wink, and Logitech Harmony hubs. A hub will help link your ecobee3 thermostat together with the rest of your smart home devices so they can be controlled from one app. The premium Haiku smart ceiling fans are also compatible with the ecobee3. The Haiku fans will work with your ecobee3 thermostat to optimize your home’s heating and cooling. You can use a free IFTTT account to set up all kinds of interactions with other smart home devices. One of the problems with the old programmable thermostats is how difficult they were to actually program. The ecobee3 utilizes what they call comfort settings to allow you to easily program your schedule. There are three default comfort settings: home, away, and sleep. Tell the smart thermostat when you will be home, away, and sleeping. Then go back and decide which temperature settings should accompany each comfort setting. 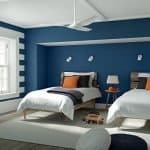 A fourth comfort setting is called vacation mode. Adding a vacation to your schedule is as simple as entering the start date and return date. While you are gone, your home will be kept at your energy-saving vacation mode set points. And, upon your return, it will switch back to normal to welcome you home. The advantage of using vacation mode instead of just programming an extended away period on your schedule is that you won’t have to change your already programmed schedule. The vacation mode overrides your existing schedule. First, you set up your weekly schedule. You tell the thermostat what times you are most likely to be home and what times you are most likely to be away on any given day. Then, if your sensors detect that you have been out of the house for more than two hours during a scheduled “home” period, the ecobee3 will switch to away mode. There’s no sense in heating or cooling an empty house, right? Smart home/away also works in the opposite direction. If you happen to be home during a scheduled “away” time, the sensors will detect your presence and the thermostat will switch to your “home” comfort setting. 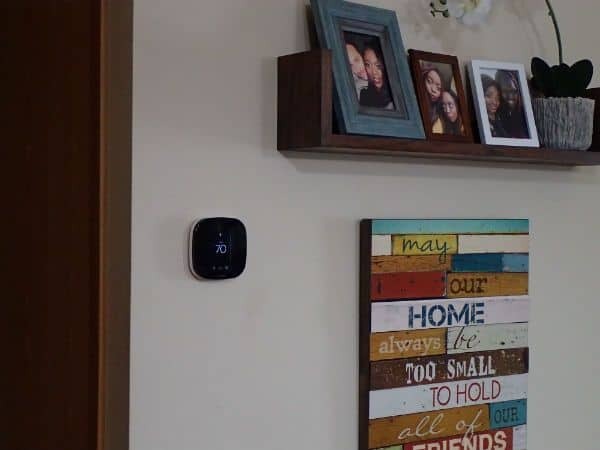 The smart home/away feature works as intended, but there are drawbacks to using motion detection as the only means of determining whether anyone is home or not. 1.) There will be times when you are watching a movie or reading a book and the motion sensors won’t be detecting any motion even though you are actually home. In order to account for those times, the system waits for 2 hours of no motion detection before it decides to switch to away mode. That means when you actually do leave, it will take 2 hours before it switches into energy saving “away” mode. 2.) If you come home during a scheduled “away” time, your ecobee3 won’t switch to “home” until you get home and trigger the motion sensors. You’ll have to wait while your system works to return your house to the “home” comfort settings. Wouldn’t it be great if it could somehow know you were on your way home before you actually got home? You could avoid these drawbacks by using the Quick Change feature on the ecobee app whenever you come or go. But, that would require extra action on your part. It wouldn’t be a very smart solution. Use the Quick Change screen for occasions when your schedule is different than normal. Or, you can try geofencing. There has to be a better solution, right? Of course, there is. It’s called geofencing. You can use the GPS location of your smartphone to signal to your thermostat whether you are home or not. Geofencing is built directly into the ecobee app for both iOS and Android. But it only works for one person. If you want geofencing to work with multiple users, you’ll have to use some third party software. For a complete guide on how to do this, take a look at my tutorial on how to use geofencing to control your ecobee thermostat. The ecobee3 can calculate how long it will take to heat or cool your home from its current temperature to the desired target temperature. That way, if you are scheduled to come home from work at 5:30 pm, the system can kick in before you get there. Then, by the time you get home, your house will be right at the temperature you desire after a full day’s work. The green bar shows the period of time Smart Recovery was active. It shows the heat turned on a little after 4 am so that it could reach the desired set-point by 5:30 am. In order to accomplish this feat, it takes a number of factors into consideration including current weather conditions, your HVAC equipment, past performance, and even number people in the household! The ecobee’s smart sensors make it unique among its competitors. In addition to the main unit, you can place these little satellite sensors around your home. They will send temperature and occupancy data from all around your home back to the base. How cool is that?! I’ve written an entire post on the ecobee sensors which explains everything you might want to know about them. If you buy the ecobee3 on Amazon, you will get one sensor with your thermostat. If you want more than one, extra sensors can be purchased in packs of two. Need some extra sensors? Click here to buy on Amazon. You can choose which sensors to include with each comfort setting. For example, I only have my base sensor and one satellite sensor which I placed in my bedroom. For my home and away comfort settings, I only use the base sensor. But, for my sleep comfort setting, I only use my bedroom sensor. If Follow Me is enabled, the ecobee3 will only use temperature data from sensors that are currently reporting activity. For example, let’s say you have a sensor in the living room, the kitchen, and an office. If the only room detecting motion is the living room, then the thermostat will only use the temperature reading in the living room to determine what it should do. My Home IQ Follow Me report shows each sensor’s activity and their calculated average temperature. If you are sitting in the office and the kids are watching TV in the living room, both sensors will report activity. The ecobee3 will take the temperature reading from each active room and average the two. Follow Me will not instantly average all sensors reporting motion. A given sensor has to continue reporting motion and over time, that sensor’s temperature data will be averaged in. For example, if you happen to run into your bedroom to grab something then leave again, Follow Me will not immediately include the bedroom sensor in the average temperature. The ecobee3 has the most comprehensive energy reports of all its competitors. The feature is called Home IQ and it’s accessible through the web console. You can use Home IQ to access up to 18 months of data on system activity, fan activity, sensor temperature, and sensor motion. All the graphs from in this article are from Home IQ. The monthly Runtime Report shows you an estimate of how much you saved with your smart thermostat. Home IQ also gives you monthly reports that compare your energy usage to other users in your area. The Weather Impact graph shows how the daily temperature average influences your total system run time. 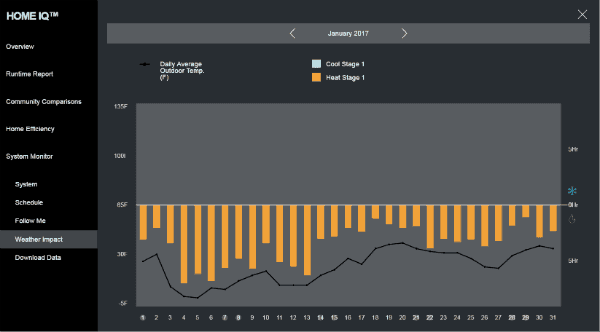 The orange bars are the daily run time (hours) for my heat and the black line is the daily average temperature. A great smart thermostat needs to have more than just a bunch of fancy smart features. It should also have all the features that a great non-smart thermostat would have. In my opinion, this is another area where the ecobee3 stands out from the competition. Nearly every setting you can think of is adjustable. 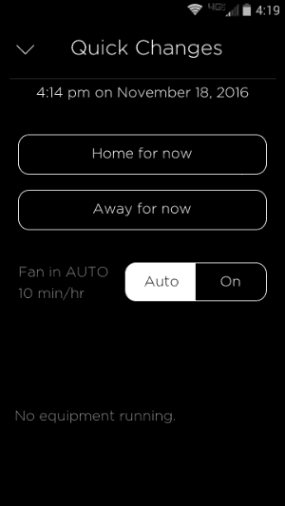 Fan Circulate- This feature lets you run your fan at regular intervals without running your heat or AC. You cannot schedule a specific run-time, but you can specify a number of minutes that you would like it to run per hour. The image below shows my fan activity with the circulate feature set to 10 min/hr. The orange bars are the times the heat has turned on and the gray bars are the times the fan turns on. You can see that the fan is always running when the heat is running, but it also comes on intermittently if the heat isn’t on. I live in the Midwest and there are many spring and fall days when neither heating or cooling is needed. However, I would like some air circulation from time to time just to filter out dust and keep the place fresh. That is exactly what the Circulate Fan feature does, so this feature is a big plus for me. Fan Dissipation- For forced air systems, the thermostat can keep the fan running for a set period after the AC or heat turns off. ecobee calls this Fan Dissipation. The idea is that there is still useful heating/cooling left in the system immediately after it shuts off. So if the fan shuts off immediately, it would be wasting a small amount of energy by shutting off the fan. This isn’t a new idea. In fact, most modern HVAC systems do this. What is cool about the ecobee3 though is that you have direct access to this setting. You have the option to adjust the time the fan runs for both heating and cooling modes. The ecobee3 also has a humidity sensor within the base. If you have a whole house humidifier or dehumidifier, it can be controlled by this thermostat. However, there is only room to connect one accessory so you can only choose one. AC Overcool- Your air conditioner naturally functions as a dehumidifier during normal operation. So, if the ecobee3 senses the humidity is higher than desired, it can continue running the AC even as the temperature goes below your lower set point in order to remove more moisture from the air. There is a setting that lets you choose how far below your cooling set point AC over-cool is allowed to go. This setting is only accessible from the base. Is ecobee Compatible With My HVAC System? 1. The ecobee3 will not be compatible with high-voltage systems. This includes electric baseboard heaters or other electrically powered radiant heating devices. If that’s what you have, take a look at these options instead. 2. 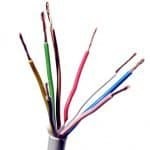 If your thermostat wiring doesn’t have a c-wire (what’s a c-wire? ), setting up the ecobee3 will require an extra step. The package comes with ecobee’s Power Extender Kit (PEK). This allows anyone without a c-wire to connect to the ecobee3 using their existing wiring. However, it will require some additional wiring at your HVAC Control Board. The PEK installation is not difficult, but it does require you to read a wiring diagram. If you’re not completely sure you know what you’re doing, I recommend consulting someone who does because broken furnace parts and service calls tend to be expensive. Which ecobee Is Right For Me? This thermostat has been on the market now for almost 5 years. Since it’s been released, ecobee has come out with a couple other similar but different versions. Remote Sensors – Initially, the ecobee3 Lite didn’t support sensors. Now, it does. However, sensors are not included with the Lite so you have to buy them separately. Smart home/away – There is no motion detector in the Lite so you’ll have to purchase sensors if you want smart home/away to work. If you have a smaller house or live in an apartment, you may not have the need for those extra features the original ecobee3 offers. In that case, you may be better off saving some money and going with the ecobee3 Lite. 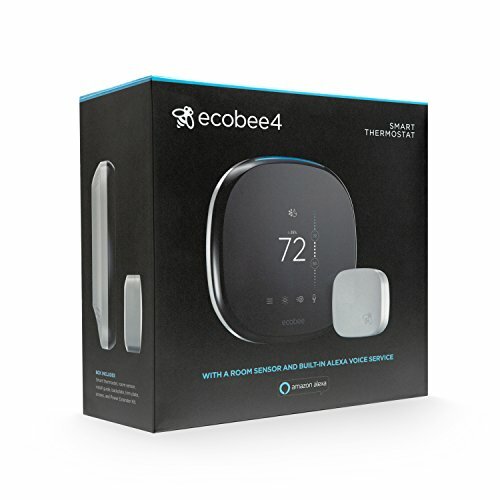 The successor to the ecobee3 has been released and its called the ecobee4. However, there is little new with respect to its functionality as a thermostat. Why the new version then? Well, the ecobee4 has Amazon’s Alexa built into it. The ecobee4 is basically an ecobee3 and an Echo Dot smooshed together. You can use your voice to control the thermostat, but you can also use it to check the weather or read the news or anything else that Alexa does. I already have an ecobee3 and an Echo Dot, so I don’t have any plans to buy the ecobee4. However, if I didn’t have either, it would certainly make sense to buy the ecobee4. The price is about the same as if you purchased an ecobee3 and an Echo Dot separately but you get the added convenience of combining the two into one device. 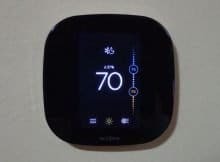 When I talk about smart thermostats, I try to emphasize that these gadgets are more than just energy saving devices. The ideal smart thermostat should enhance comfort in the home and minimize energy use all while making it convenient and effortless for the user. 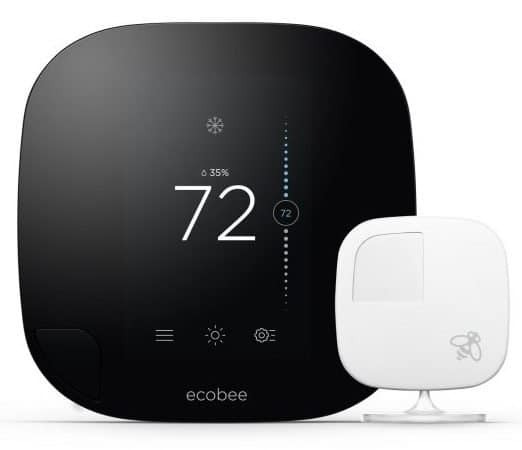 Whether it’s the flexibility offered by the smart sensors or the no-hassle convenience of Smart Home/Away and Follow Me, the ecobee3 thermostat does an admirable job of striking a balance between savings and comfort. I would recommend it to anyone looking to buy a high-quality smart thermostat. Still not sure if the ecobee3 is what you’re looking for? See my comparison of the ecobee vs Nest. Is it possible to control two HVAC combo units with one ecobee3 thermostat? One ecobee3 cannot control more than one zone. If you wanted to control each unit independently you would need two thermostats. In fact, I don’t believe there is any consumer grade smart thermostat available that can do that.